EL CAJON (3-24-2019) – Valhalla High junior Joseph Ingrassia took advantage of an opportunity not given to one of his teammates earlier this week. And Norsemen head coach was leaving nothing to chance in a scoreless game against the Mount Miguel Matadors on Saturday. The pitcher was allowed to continue on the mound as long as possible, finally finishing with a no-hitter in Saturday’s (Mar. 23) 2-0 decision over the Matadors. 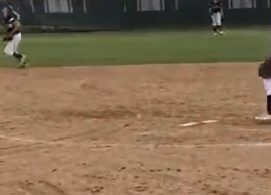 Ingrassia finished with 14 strikeouts, however, the triumph only gave the Norsemen a split of the home-and-home series to open Grossmont Valley League play. On Wednesday, Norsemen pitcher Riley O’Sullivan was pulled following five perfect innings, but the Matadors rallied against the bullpen for a 5-3 triumph. Either way, the no-hitter by Ingrassia is his second in as many seasons. Last year as a sophomore, he struck out 12 in a victory over West Hills. Ingrassia becomes the second Norsemen to ever record two career no-hitters — matching the feat of Greg Johnson in 1977-78. 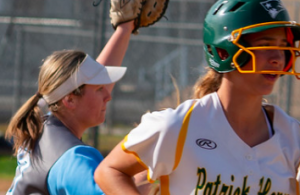 Ingrassia is also the sixth East County pitcher to achieve the feat, yet more remarkably, the first since wood bats were phased out of the game at the high school level. The others were Jeff Byrd of El Capitan (1972-74); Dave Ciampoli, Helix (1977-78); Scott Adams, Granite Hills (1980-81); and Jeff Barry, Santana (1984-85). The section career record is three on three occasions. One was last season by Trevor Elliott of Mountain Empire, plus pitchers from Holtville and San Diego Jewish Academy. As far as Valhalla was concerned, Ingrassia needed to be at his best as the contest remained scoreless through five innings, as Mount Miguel pitcher Thomas Ringer was firing a 2-hut shutout through five frames. However, the Norsemen parlayed three hits into the ballgame’s lone runs in the 6th. Starting from the top of the lineup card, Kyle Casper (2-for-3) opened with a single, setting up a bunt situation for Ingrassia, who bunted Caser to second base. Ethan Dunnam singled to place runners on the corners, then O’Sullivan, grounded an infield single off the third baseman as part of a drawn-in infield. Trey Henige drew a bases-loaded walk for the first run. Two batters later, Austin Scribner lifted a sacrifice fly to plate Dunnam with the insurance marker on an infield fly. The throw home was cut off. “Well if you’re going to lose to a top team buy a no-hitter that’s about the best you can do,” Mount Miguel head coach Frank Coit said.”Ingrassia was dominant on the hill. We had runners in scoring position a couple of innings but really couldn’t come up with a key hit. “Our sophomore Thomas Ringer was unbelievable. Our kids played an awesome game it was a terrific high school baseball game. Great defense, great pitching, very little hitting but that comes with great defense and great pitching. Both sides were awesome. It was great. Valhalla moves to 9-4 overall, while Mount Miguel is 3-8. Both sides are 1-1 in GVL action. 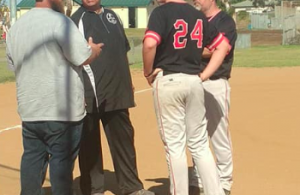 EL CAJON (3-24-2019) – Valhalla High baseball coach Ryan Wheeler’s decision to pull starting pitcher Riley O’Sullivan after five innings while throwing a perfect game against Mount Miguel in Wednesday’s Grossmont Valley League opener had to be at the forefront of his mind on Saturday. But Wheeler allowed Norsemen pitcher Joseph Ingrassia to continue after five innings with his no-hitter. In this case, the youngster accomplished the feat in the second game of a series with the Matadors. Much of the decisions probably came down to baseball philosophy for the former Grossmont Foothillers star. When does a skipper elect to bunt rather than employ the hit-and-run. Depending on the count, do you call for a fastball or a curve. There are numerous decisions that can be made on every pitch if your belief is to micro-manage. Indeed, baseball is a childhood game people love and most fans think they can do better than the people on the field actually making the choices, whether at the amateur level or the professionals. Wheeler’s decision — right or wrong — is reminescent of the second season of San Diego Padres baseball. The expansion team was managed by Preston Gómez, who was originally mentored by Hall of Fame manager Walter Alston. A much-respected baseball mind, Gómez spent more than 40 years as a manager, coach, and special assistant in Major League Baseball following a 20-year playing career, including eight seasons as a middle infielder with the Washington Senators. Locally, long-time Padres fans may remember a late July 1970 game when pitcher Clay “The Kid” Kirby was throwing a no-hitter against the defending world champion New York Mets. The rub: the Mets led 1-0 with Kirby scheduled to bat in the bottom of the 8th inning. Gómez’ philosophy: do what you have to do to win the ballgame. It didn’t matter that San Diego was more than 30 games out of last place and were destined for another last-place finish. So Gómez pinch-hit for Kirby. The batter — future World Series champion manager Cito Gaston — struck out. The Padres bullpen blew the no-hitter. The Mets won, 3-0. Gómez insisted he would do it again. Four years later when managing the Houston Astros, an identical scenario involved pitcher Don Wilson, who had a no-hitter going through eight inning. Again, Gómez called for a pinch-hitter (who made out). Houston would lose. And Gómez again insisted he would do it again. This story isn’t about Wheeler’s decision on Wednesday. Arguments can be made he was thinking about maintaining O’Sullivan’s arm and keep him healthy for a potential CIF playoff run. Maybe he was following the CIF’s “Winning With Integrity” guideline by not rubbing it in on Mount Miguel. And, yes, maybe Wheeler didn’t see the forest from the trees and should’ve let his ballplayer continue and try to make school history.